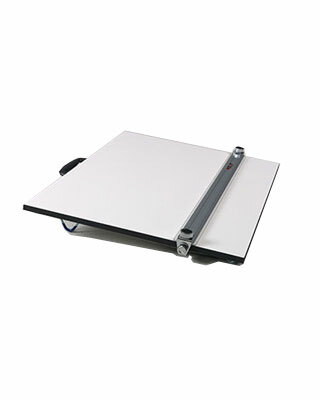 The PRO-DRAFT Series Parallel Straightedge Board is an improvement on existing technology, which employs lightweight boards,eliminates the need for an acrylic straightedge or T-square and is designed with an inking edge. The PRO-DRAFT parallelogram technology ensures accuracy, providing for professional results. On each side of the PRO-DRAFT Parallel Straightedge Boards are locking knobs that will allow the user to align the straightedge to his drawing, or to change the angle of the straightedge and still keep that new angle parallel. The Back of the PRO-DRAFT features black deep ribbed strips which are designed so that the PRO-DRAFT Parallel Straightedge Boards can be positioned hanging on the edge of a work surface like a table, and easily be moved literally into the user's lap without having to readjust. The Rubber feet under the PRO-DRAFT board provide added stability and minimize the chance of slippage, while the comfortable handle helps prevent dropping in transport.